This 40 over game turned out to be an unusually one-sided affair as the home team were without their regular players. The Allen-Turners had joined another club, Mark Lazarczuk was injured, Ben Harris was into football, and stalwarts Russell Cox and Dan Fearnley were not available. So it was no surprise that we were inserted. 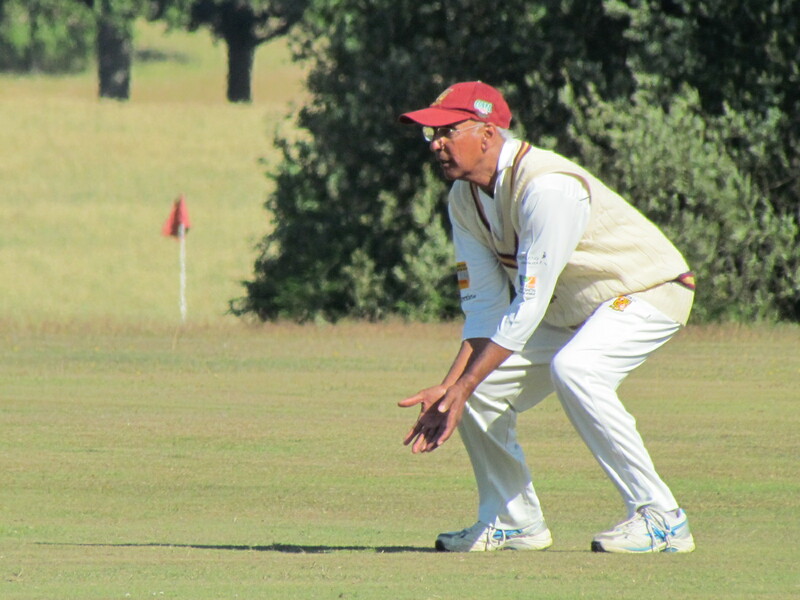 San and Ravi gave KCC a solid start on this low and slow wicket putting on 51 before both were dismissed in successive overs. 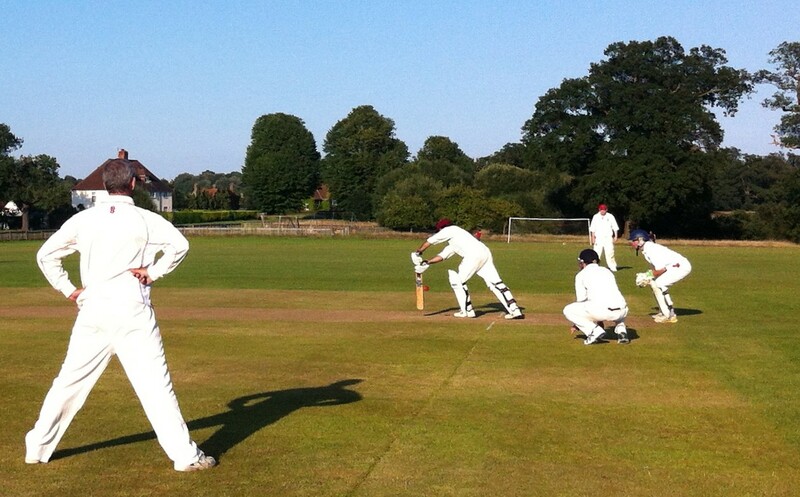 Although Pammi fell early Nitin and Eddy cashed in against some wayward bowling going at nearly 8 an over. Skipper Shahzeb and Ali then accelerated the pace even more, followed by an exhilarating 9 ball 19* from Hammad to really put the boot in. A total of 265 that included 50 extras looked daunting and indeed impregnable. And so it proved. The pace of Hammad and Wajid simply blew away the first four batsmen, all to well-held catches (3 into the safe hands of Saurav). 17/4 after 6 overs brought a hurried change of bowlers. 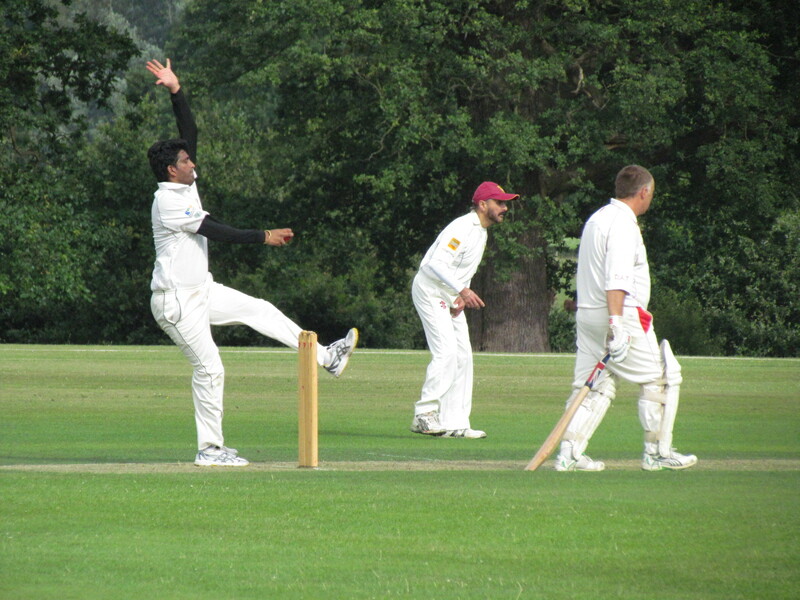 Sunil bowled steadily without any success and Saurav was a bit off-colour as Simon Lazarczuk took a shine to him. 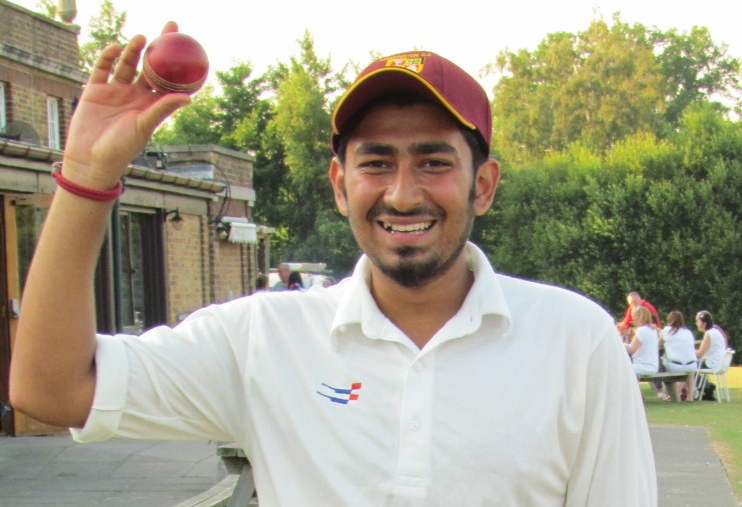 Saurav though had the last laugh with his wicket, Shahzeb holding a fine catch behind the stumps. Only Eddy Lazarczuk at no.9 offered any resistance after that as the returning Waj whipped out two more and then Pammi and Ravi wrapped up the tail. An overwhelming victory, but hardly satisfying as WGP appear to be going through a rebuilding phase with a group of young players. No doubt they will be a formidable opposition soon. San waits for the slip catch that never came! 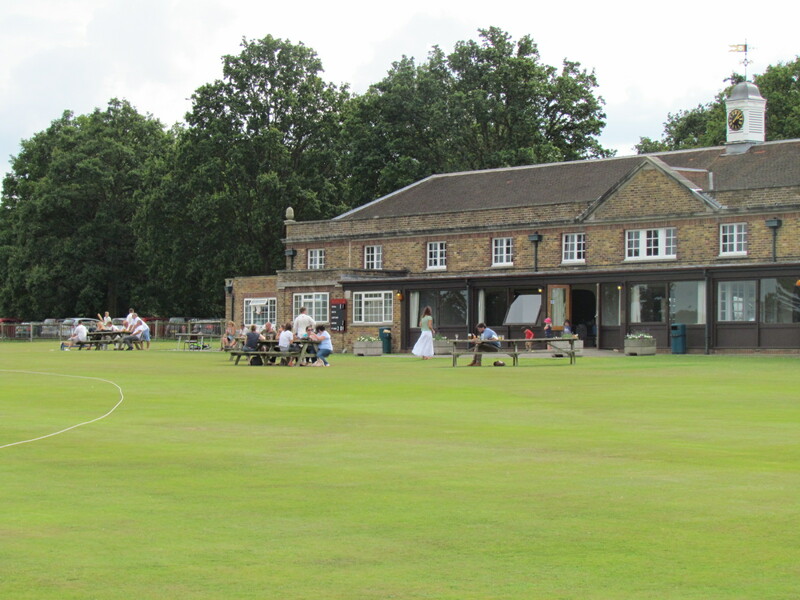 This 40 over game turned out to be a local family affair in which KCC were outdone by the Allen-Turners, both in bowling and batting departments. Shahzeb won the toss and elected to bat on a dryish and slow turner. Rohan and Bharat gave us a good start at 6 runs an over in a fifty run stand before Bharat timed the ball too well this time to a fielder standing at long off (next time please go over the fielder or play ground shots). Rohan played some beautiful drives and cut shots to take his individual score to 38, when he was senselessly run out in a crazy mix-up with Gautom. Two overs later Gautom too departed (83/3) leaving Pammi and Shahzeb to rebuild the innings, both struggling to accelerate against the accurate spin of Dan Fearnley and Mark Lazarczuk. When Pammi fell lbw the score was 125 with only 11 overs left. Time for Shahzeb to let loose, which he did. Ali and Regan kept him brief company. Saurav then produced an exhilarating cameo striking 26 in just 14 balls as he and Shahzeb put on 38 in the last four overs to reach 209 – a defendable, though under-par score. 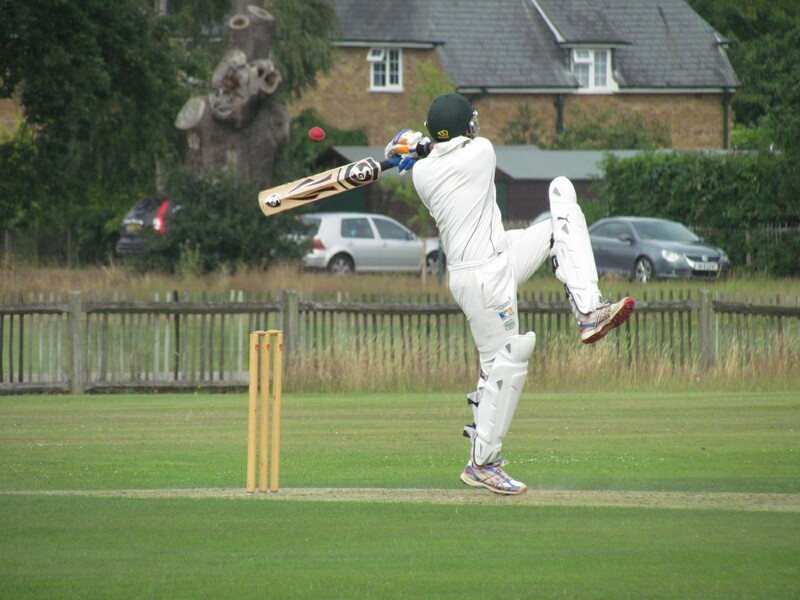 We started well with Regan’s superb catch at midwicket off the indefatigable Saikat to dismiss Ben Harris. 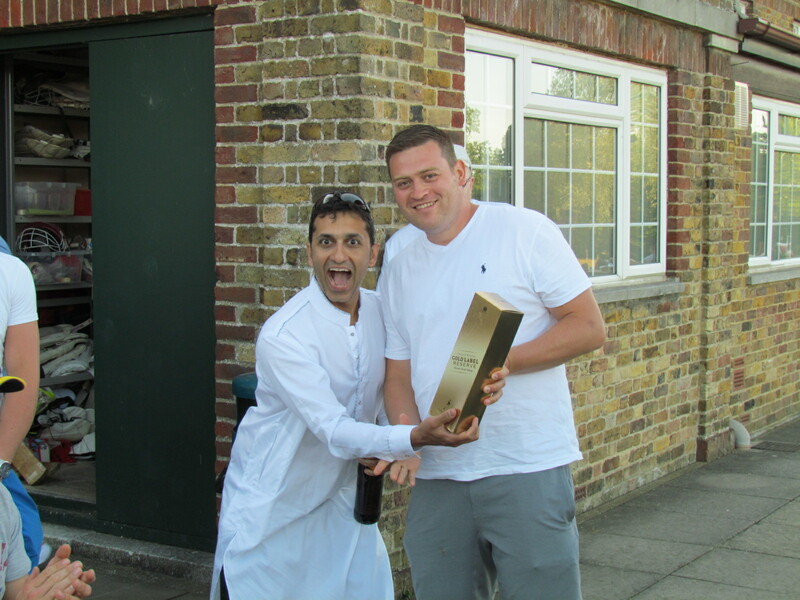 KCC’s excitement at Ben’s dismissal was short-lived, however, as Deano and his son Adam played exceptionally well to nullify KCC’s bowling attack. They put on a century stand, only broken by a silly run out (words said later at home, no doubt?). 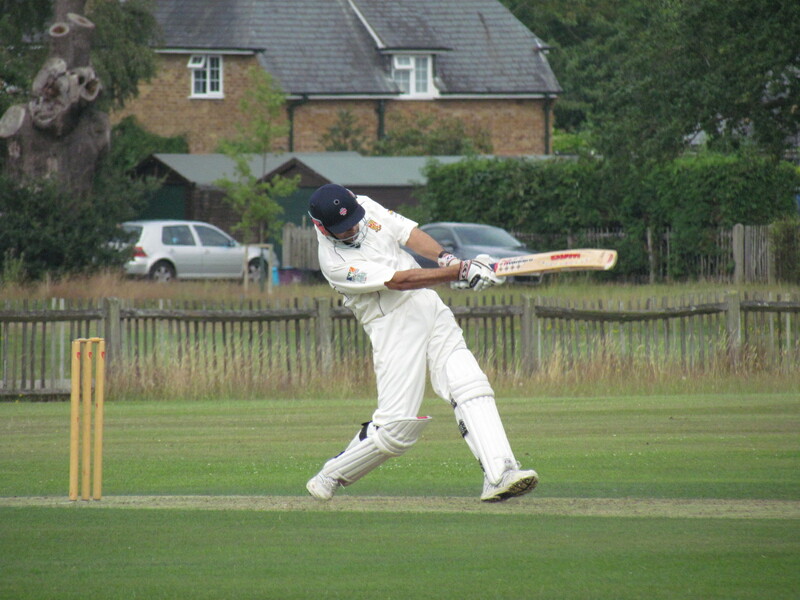 Deano and Mark Lazarczuk continued the momentum as our spin attack failed to exploit the proper length on a turning track – Saurav, Pammi and Gabriel going for plenty, although Gabriel picked up both their wickets as a consolation. 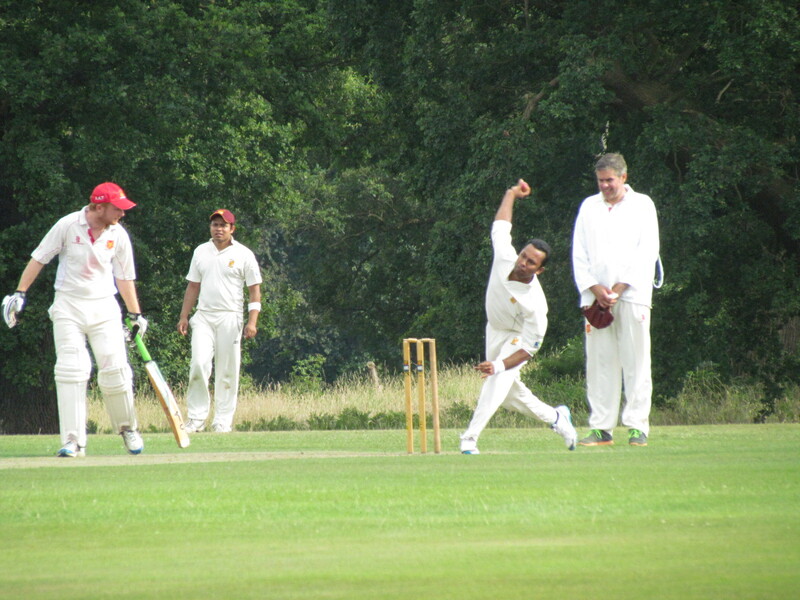 WGP cantered home with two and a half overs to spare. 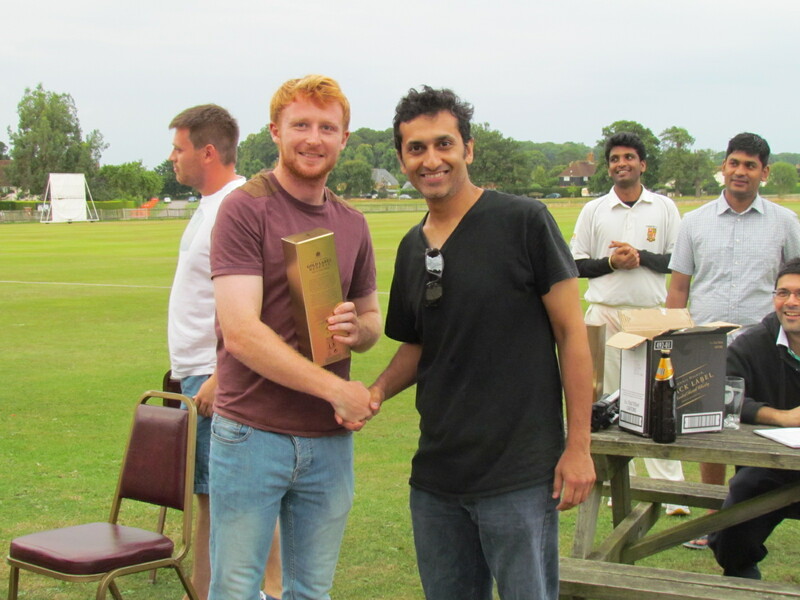 Shahzeb for his 60*, and Adam for his 64 and 2/26, were declared Men of the Match. And so to Windsor once again to do battle with the Lazarczuk lads, always a tough ask to compete with, and historically we have come off worse. But this year we had a better side than for some time. San won his third toss in a row (always a good omen) and chose to bat on the usual slow, bounce-less, turning track. 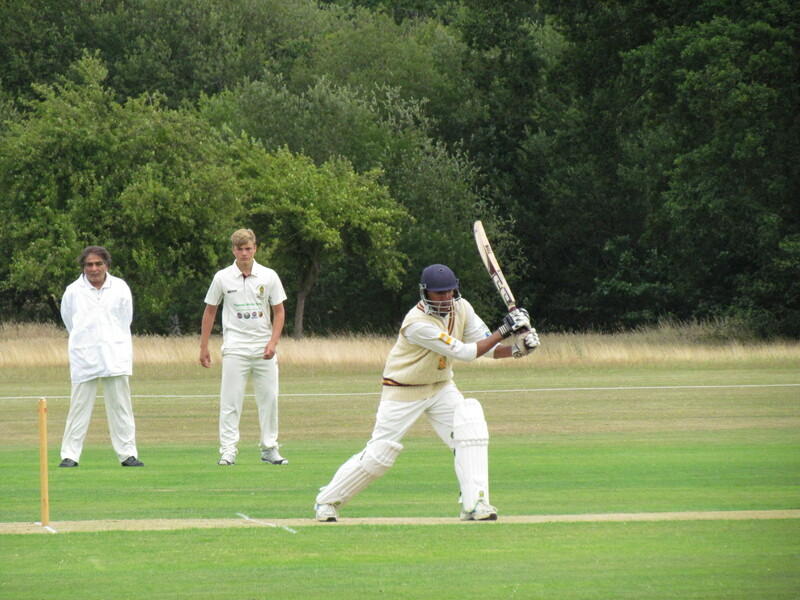 KCC top guns, Tim and Ajit, made a bright start with 61 in 11 overs. 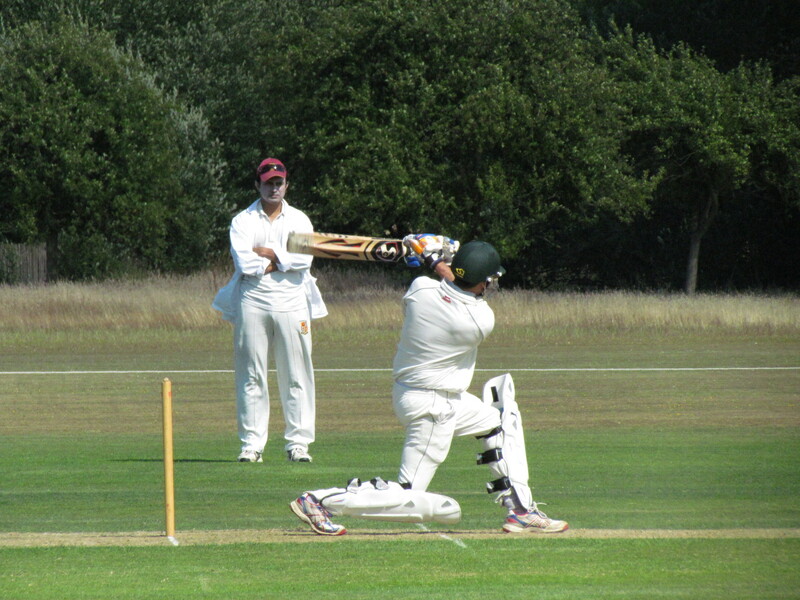 Tim was then adjudged lbw, soon to be followed next over by Ajit in like manner. 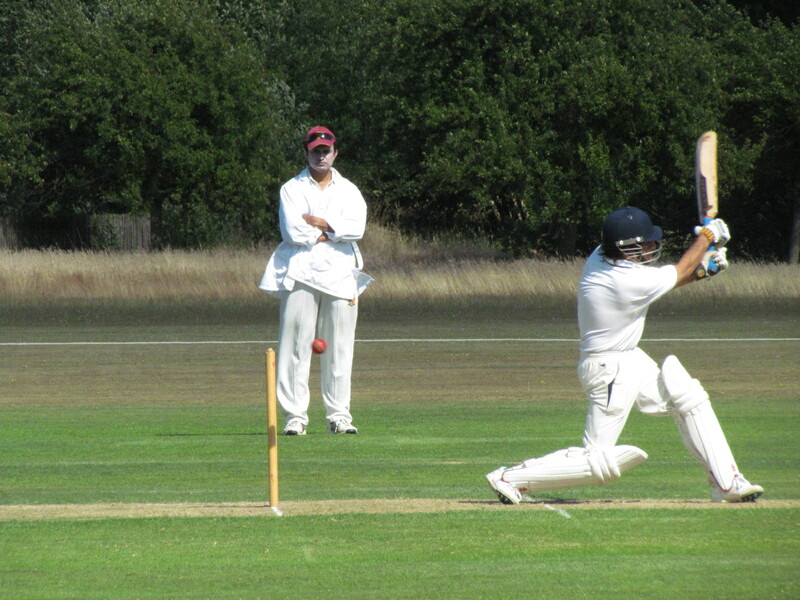 Gautom and Steve Tomlinson batted with gusto adding 79 runs in just 10 overs before Gautom holed out in the deep. 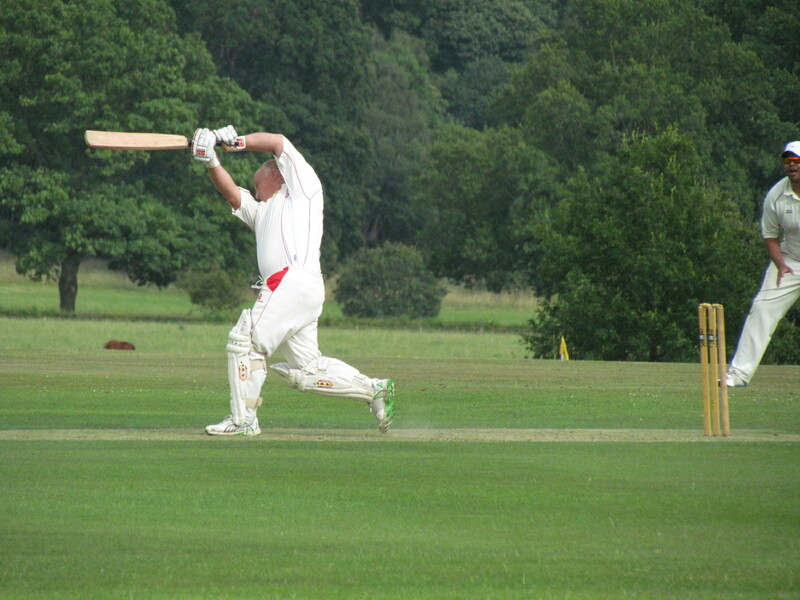 Steve in his first game for KCC was particularly severe, punching 2 sixes and 8 fours in his 49. 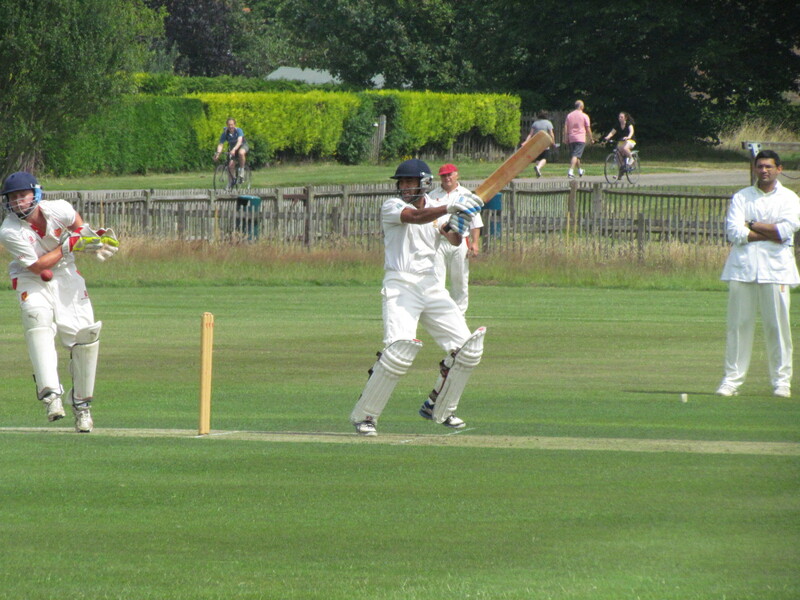 The momentum could not be sustained however as both Rohan Sur and San struggled to come to terms with the pitch. But Rohan adjusted and when San departed pieced together a fifty partnership with Ali Bilgrami who swung his bat with great effect. The declaration came at the stroke of tea. 232 was a gettable score, but KCC had an ace up their sleeve. Khush got a wicket in his first over, but then Adam Allen-Turner and Eddy Lazarczuk turned on the heat, belting the leather off the ball. Khush, Manas and Saikat looked helpless, though Manas did find a gap to bowl Eddy. 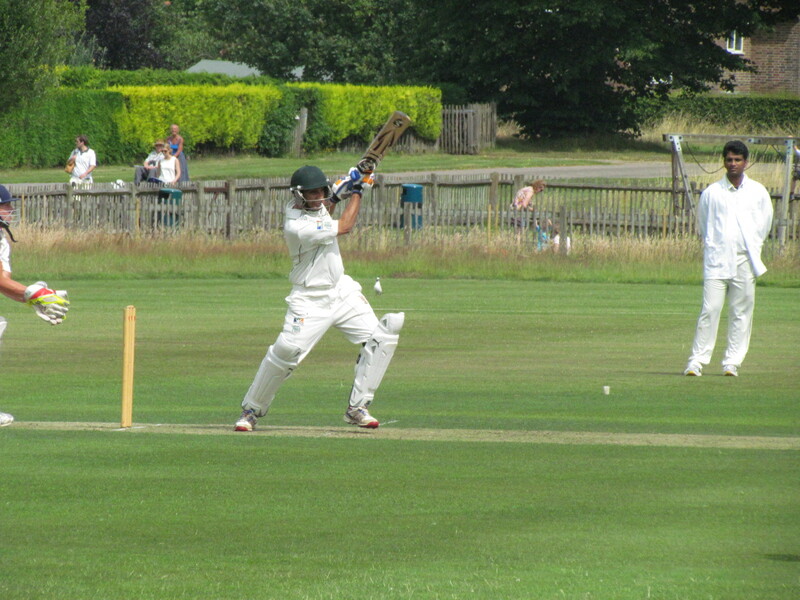 At 89/2 after the 13th over WGP were ahead of KCC at the same stage. 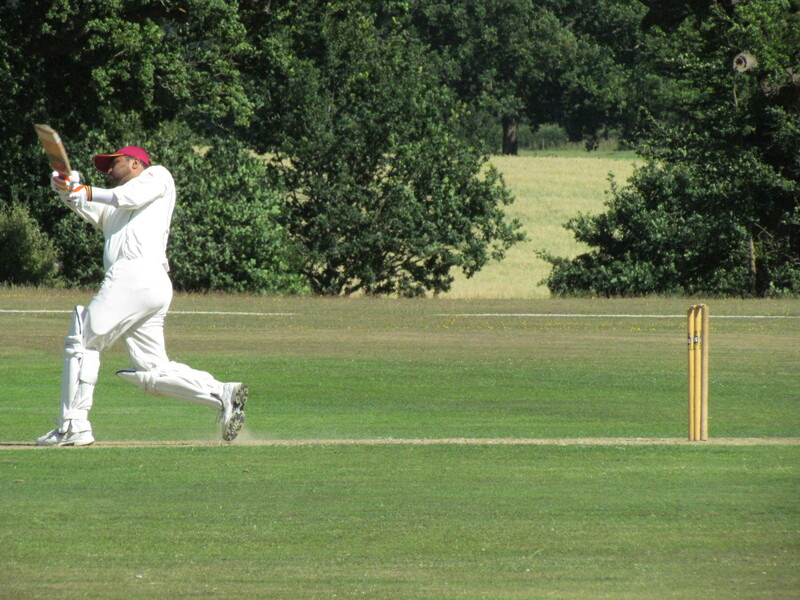 Then, the turning point (literally) as Rohan Sur (inset) was handed the ball for his off-spin. 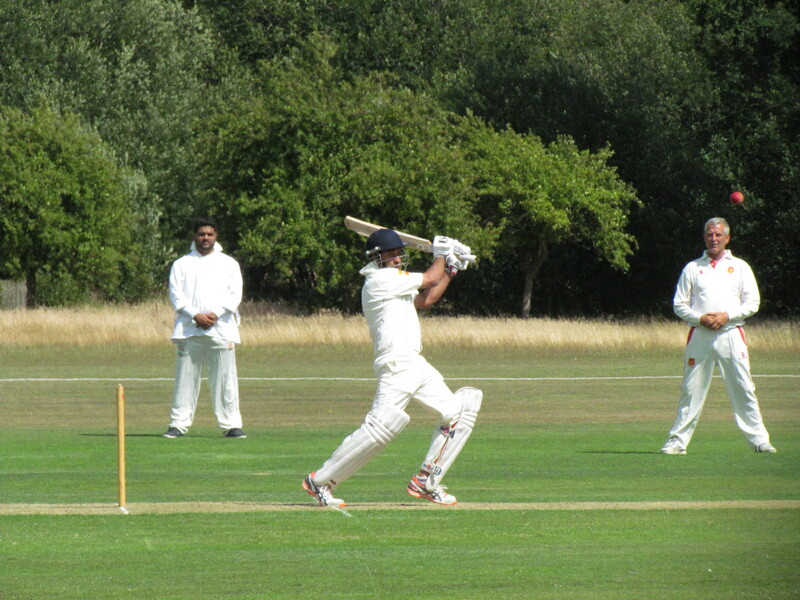 His first over produced a leading edge to Manas at mid-off. Manas could not believe his luck as he held three more catches at the same spot off similar deliveries. This was an off-spinner’s master class as Rohan got his fifth wicket to dismiss the dangerous Fearnley. All this while Adam at the other end went about attacking serenely and was playing Rohan with ease to give WGP a good chance of victory. But call it arrogance or over-confidence, whichever, he chose to reverse sweep a ball and was clean bowled by Rohan, who then wrapped up the innings to finish with 8/47; a victory with 4 overs to spare. Groundhog day, I thought as my phone rang impatiently. Herr Commissar Gore on the line. Yet again. “Where is that match report, Ro?” The truth is that I was running out of original ways of describing a thrashing. It seems like every match report I have written this year seems to involve a thrashing. Mostly of a grievous nature. 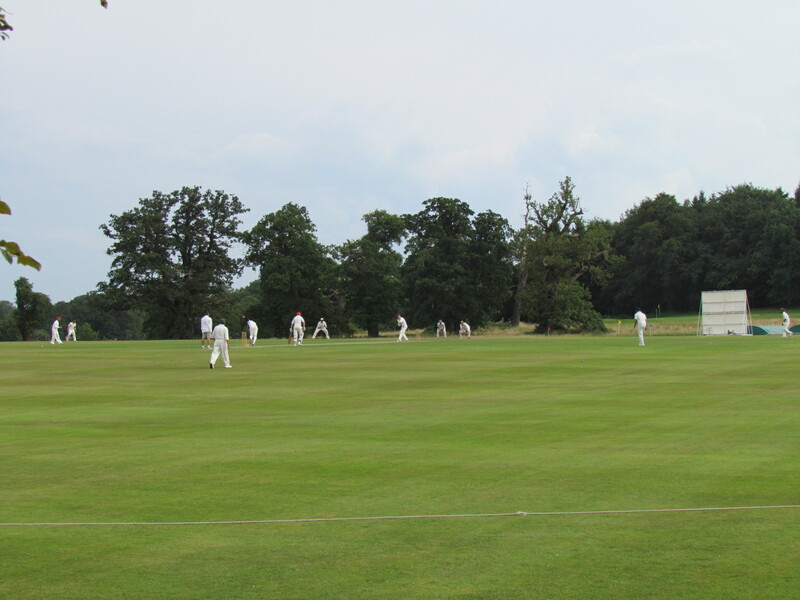 The young cricketers at Windsor Great Park have grown up. Along with body hair they have developed a ring of arrogance cradled within a core of team spirit and talent. Thrashing us silly every year is … well … ground hog day for that lot. It all started off with yet another catch dropped. A crucial one, of course. Again, by a dozing square leg. Kensington square legs have appeared bizarrely distracted all season. Much in the same manner as a dog standing by a lamp post, looking for the perfect spot to relieve itself. 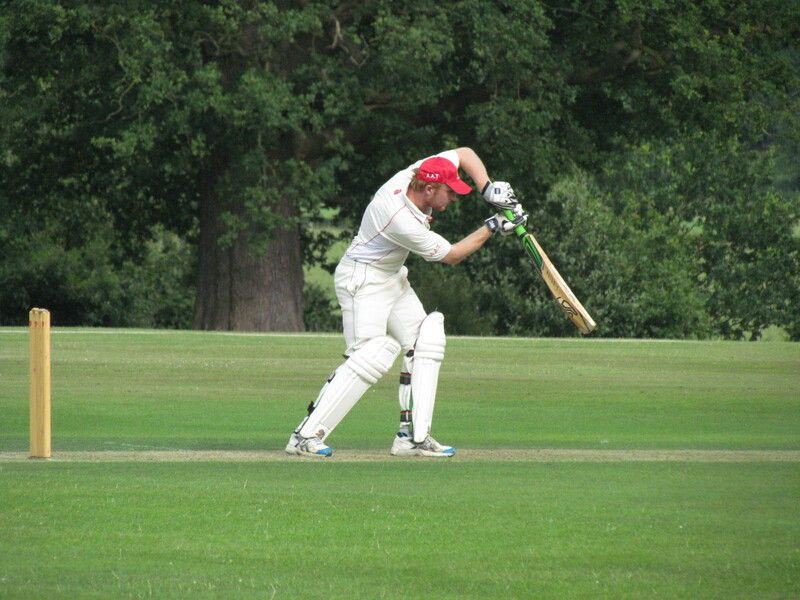 The reprieved batsman, Ben Harris, was on nought. Of course he went on to hammer a hundred. 117 to be precise. Ably supported by various soldiers from the Lazarczuk army. To our relief, at 261/5 in 35, WGP had seen enough. 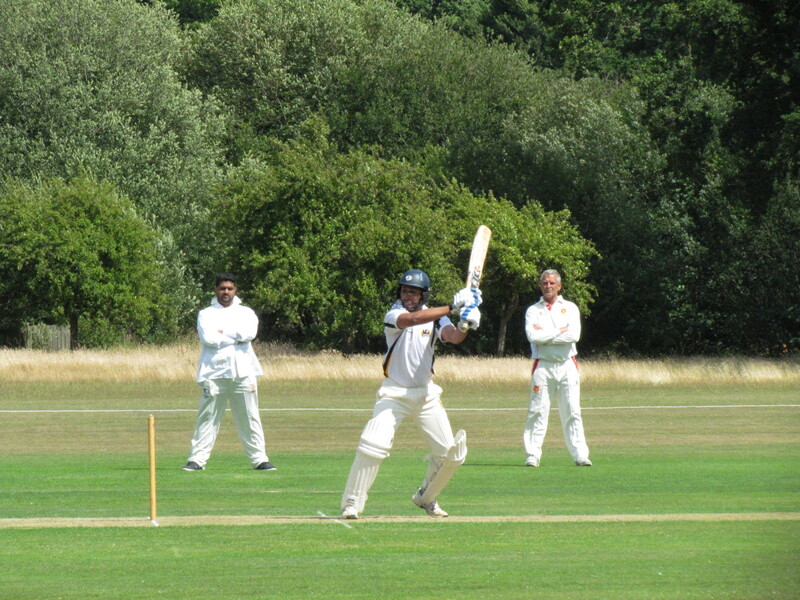 Aside from Amit (5 overs none for 17) the only other highlight in the bowling department was Saurav’s creditable assault on the century in runs conceded. 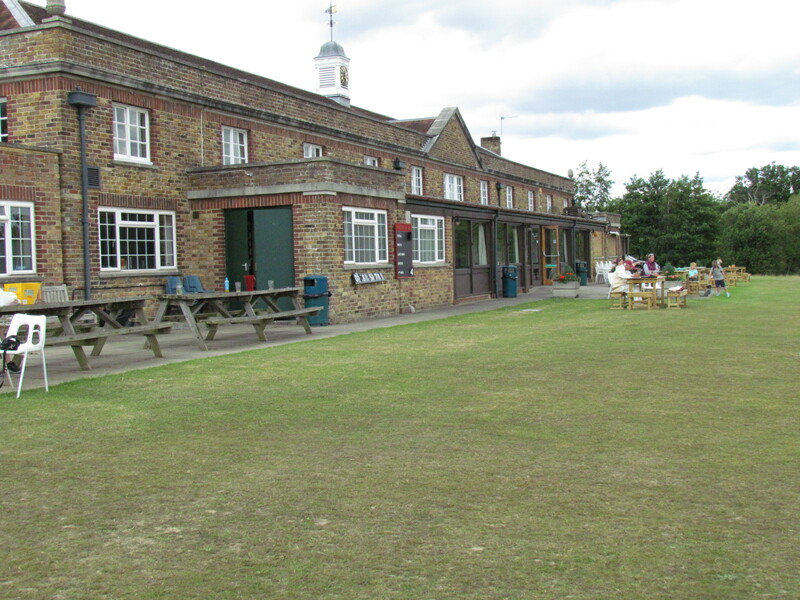 Our batting was equally woeful and inadequate. Were it not for the “match saving” 8th wicket defiance of Neeraj (8* in 41 balls) and Bharat (9* in 24), the wedgie would have been a bumper one. Neeraj displayed a resolute calm befitting Atherton, finding time to dispel words of wisdom (or was it scorn?) to a sans-helmet forward short leg. Once again, KCC managed to bore the opposition into submission. At 133/7 in 38, the match was euphemistically declared a “draw”. It was time to do battle once again with the Lazarczuk and Allen-Turner families (and the odd Cox and Fearnley) at this wonderful setting in Windsor. 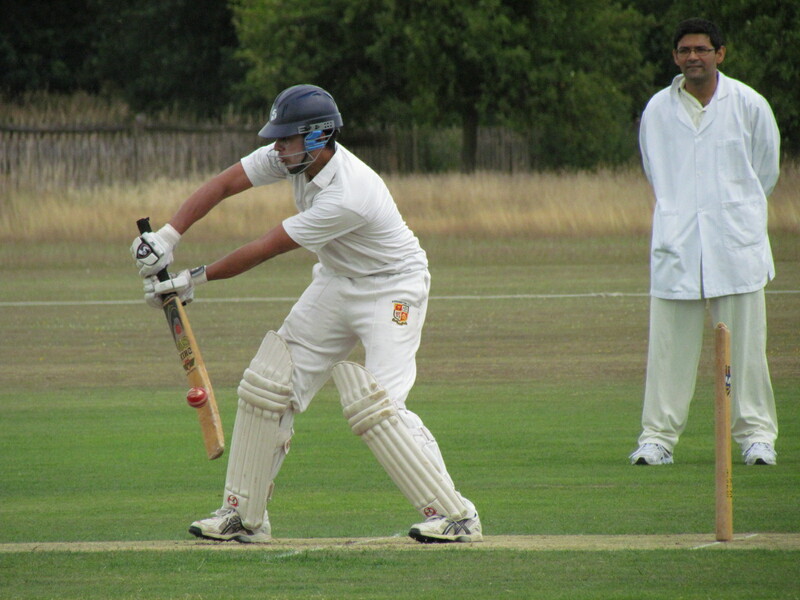 Although we were a man short, 14 year-old Vinay Chaggar plugging the gap for his debut, we were much stronger than previous visits so held out high hopes of securing a win after many a year. As usual San lost the toss and Russell Cox did not hesitate to bat first on a wicket with little to help the bowlers other than the low bounce. Matt L and Dean A-T took off like a jet at nearby Heathrow smashing the hapless Tabby and Amit aerially on this large ground, but Amit bowled Matt through the gate before he reached his fifty. 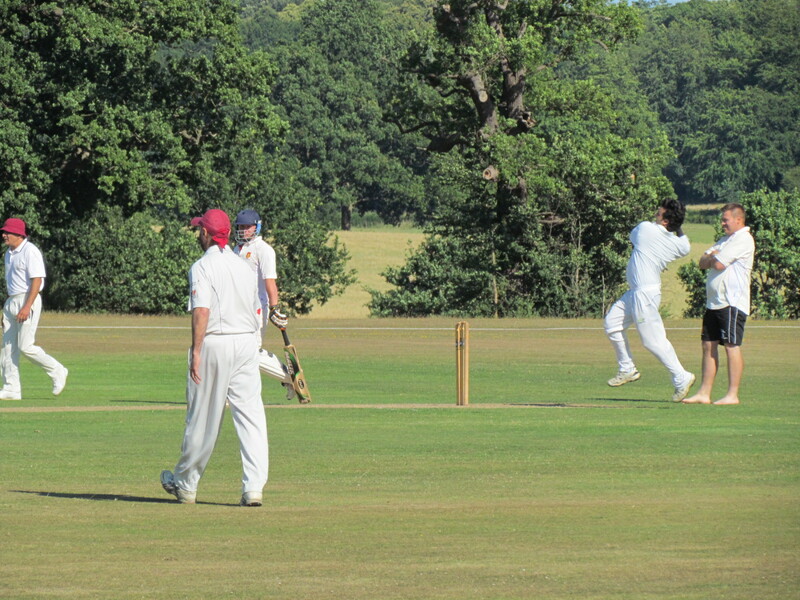 We could have done with an extra bowler (and, as it turned out later, five more batsmen) as Gabriel had to be pulled from the attack with an injured finger. 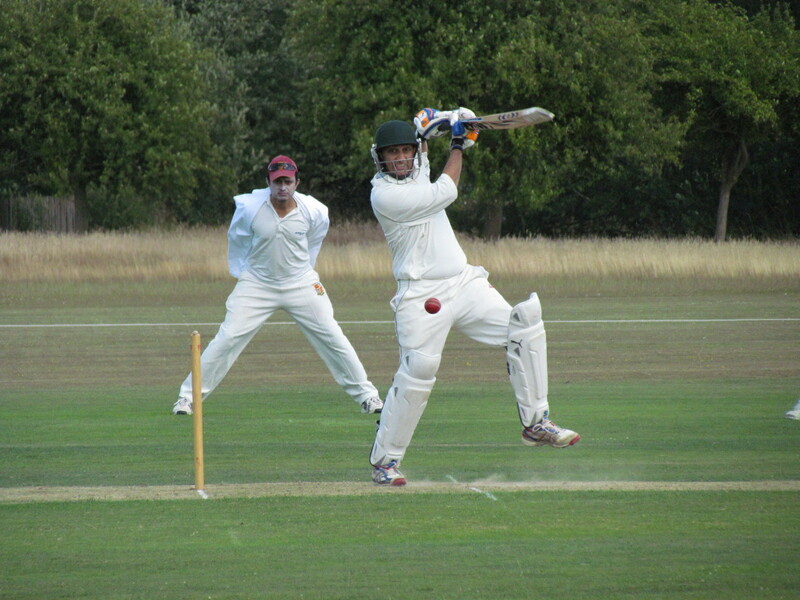 Adam A-T and father matched each other in a KCC-bashing spree until Dean miscued a potential six to Tabby in the deep off Pammi. 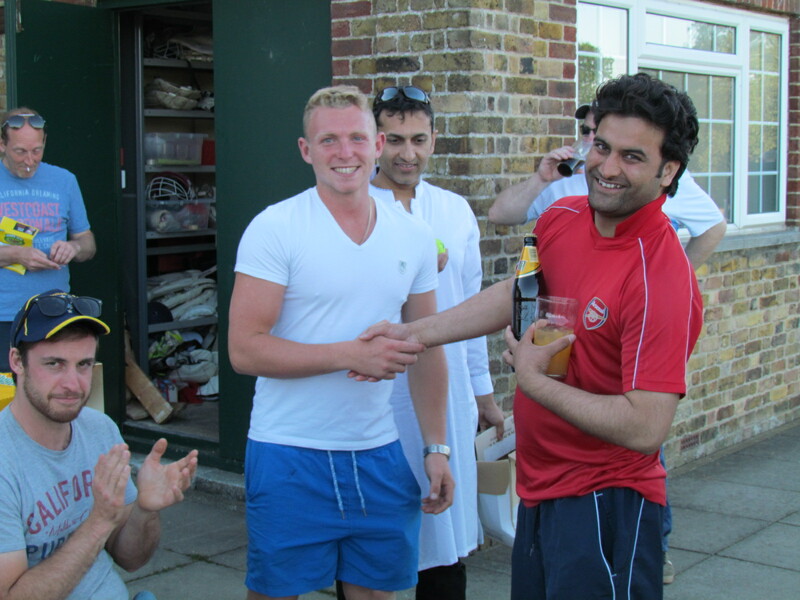 Neeraj picked up two wickets near the end but Adam continued on his merry way until the declaration. Well, 226 to get would be a doddle we thought as Amit and Usman began our reply with assured ease. Although Usman holed out just before the team fifty, David Behar showed class and spirit as he and Amit pushed on, albeit a tad slow against an accurate attack. But just as we were in command, a senseless run out ended the 88 run partnership. We now required 7 runs an over in the next 13 with 8 wickets in hand with a well-set Amit and big-hitter Shahzeb at the crease. Still a doddle. What followed three overs later would beggar the belief of the average cricket watcher, but not so followers of KCC. In 19 balls we lost 5 wickets for 6 runs. First, Adam A-T clean bowled Shahzeb then next ball uprooted Furquan’s middle stump. Amit was run out in the same over. 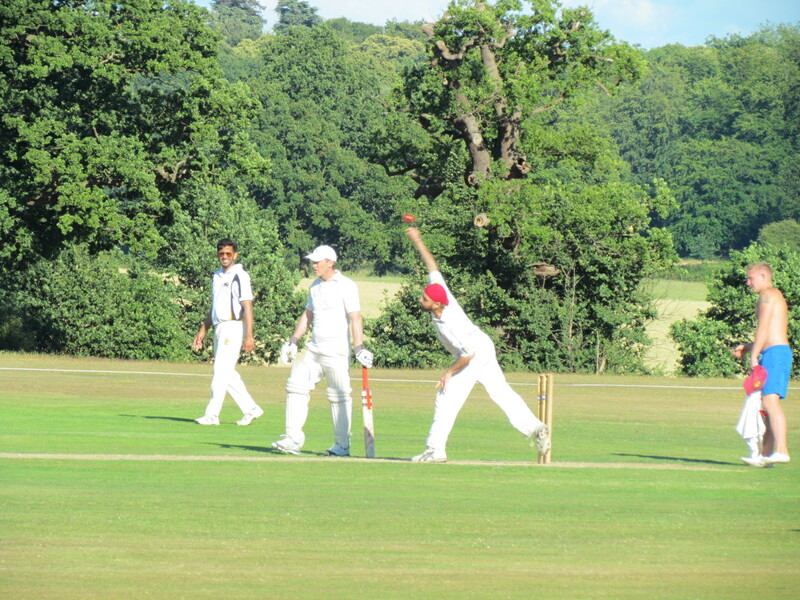 Then Tom L at the other end bowled both Tabby and Neeraj. 153/7. With 10 runs an over now needed and only young Vinay and injured Gabriel to follow, Pammi and San, still in shock, played out the innings quietly. Amit Shanker faces the Queen’s Cavalry?